It is now time for Link A Finish Friday. Today I would like to start with a big thank you to Fat Quarter Shop who has offered to Sponsor our Link A Finish Friday with Prizes. This month's winner (May) will win a $15 gift certificate to spend at Fat Quarter Shop. Are 3 of the fantastic items linked up this week. Now its time to link your finishes up. 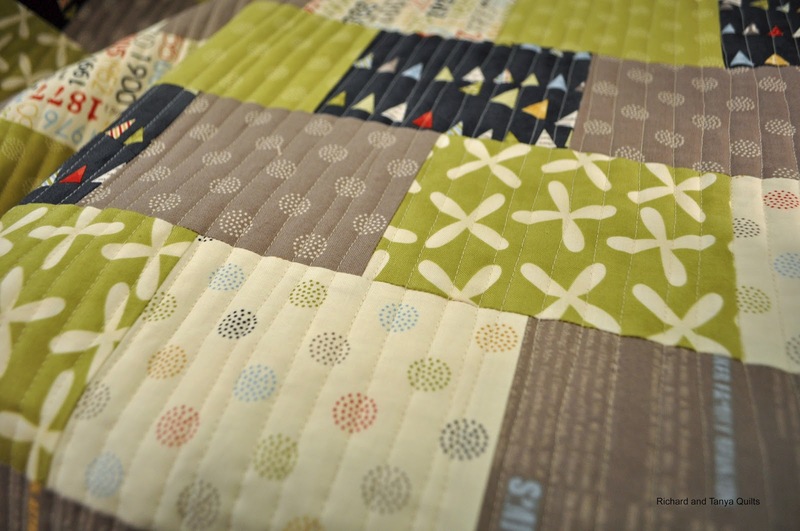 Tanya's newest rag quilt is this beautiful brown, turquoise, and aqua heart rag quilt. These are colors are some of Tanya's favorites. I like how Tanya added the brown minky on the top side of this quilt. 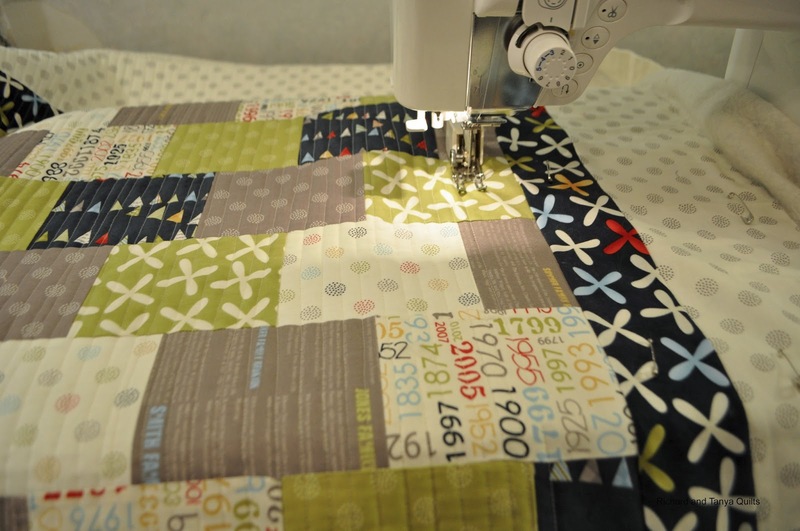 This is one of the first times we have done this though I have seen this on other quilts I admire. 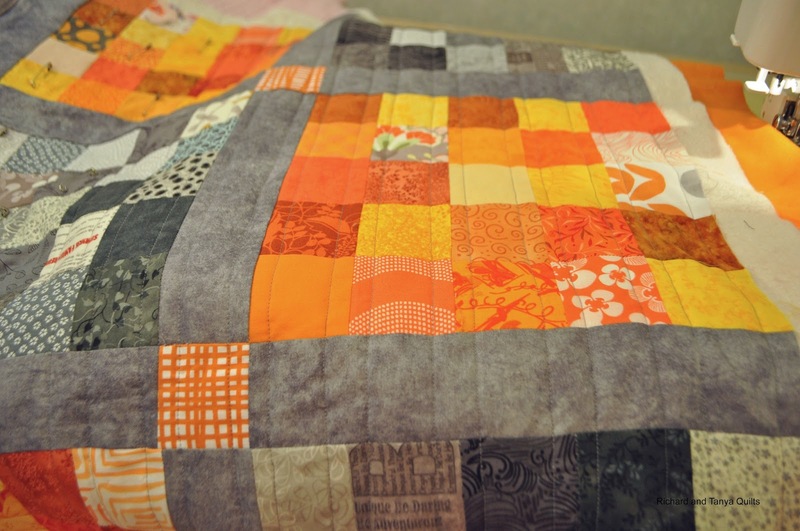 I love the look of rag quilts. 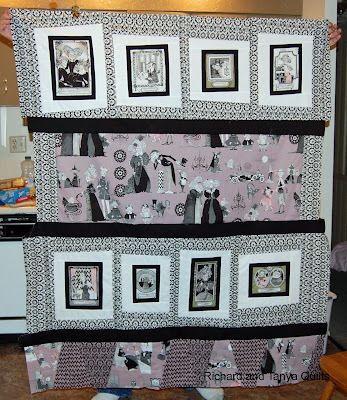 They are a simple and fast quilt to put together and its so fun to play with the ruffles on the edges. My washing machine though does not love them all that much. We tend to get it clogged up from time to time when we wash them, but it is worth it in the end. The back of this quilt is just hearts. 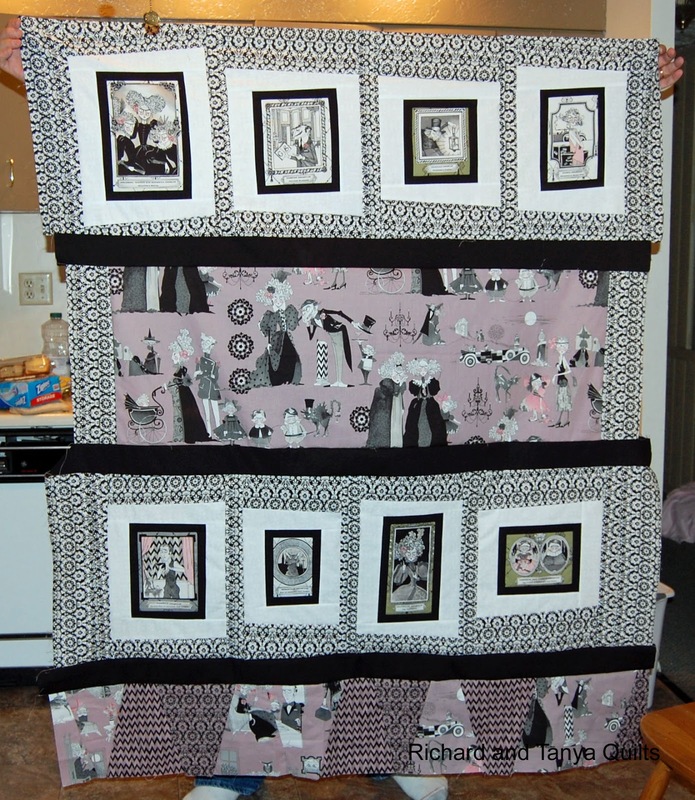 I love this quilt and we have it listed for sell on our Etsy store. 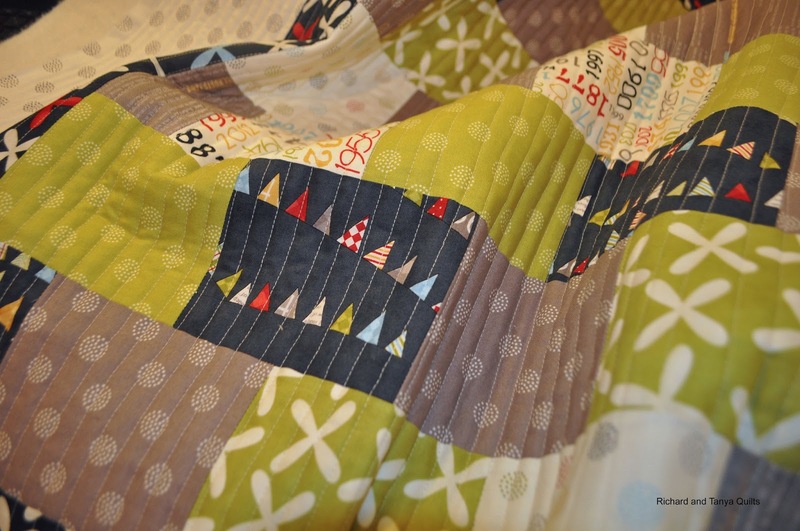 I find it amazing how well a quilt can look using only 2 fabrics to make. It has been a working weekend for me over the last 4 days. I had a extra long holiday weekend. Tanya and I both took off a extra day this week, so that we had 4 days of fun. 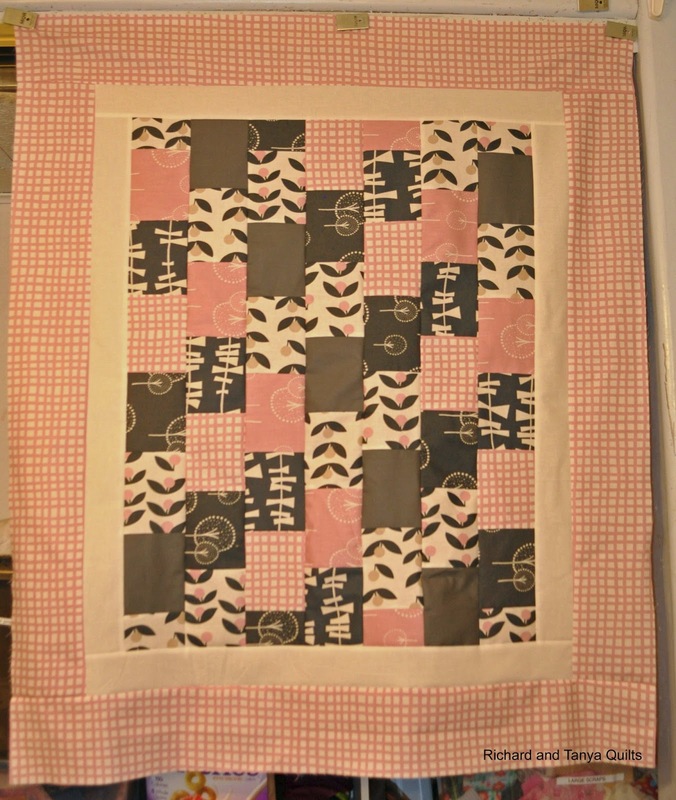 Along with the 2 pink/gray tops made from our Baby Bricks Pattern I also finished this Reunion version of it. 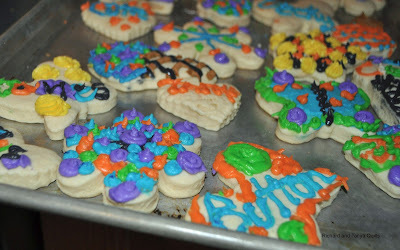 (well I also made 2 yellow/gray ones too, but forgot to take a picture of them, before Tanya started basting). I did start quilting this top. Then quilted more, and more, and more. It takes quite a while to do this, but I think it looks amazing when done. 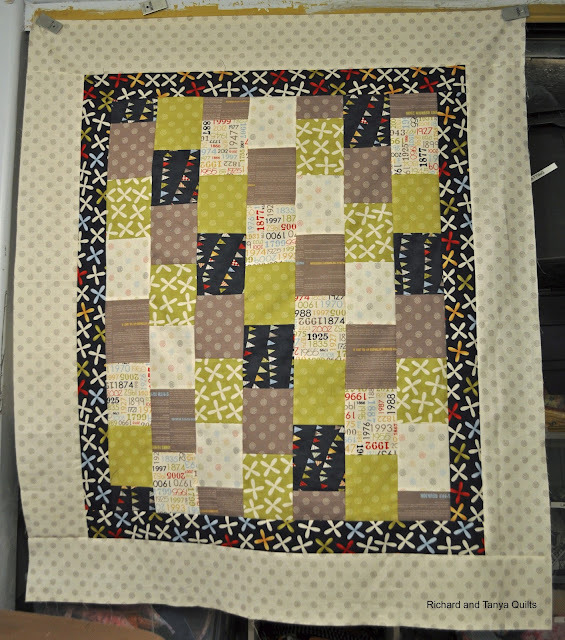 We have 3 finished quilts that we have yet to show off, this one being one of them. The sky today just did not play ball. In fact all it did is rain and rain. My brother came over today and helped me fix my sprinklers. I somehow stupidly broke the front and back manifolds last year, when I forgot to turn the water off. My brother teases me when he comes to help. He says I call him to do my "Honey do's". Which is true! LOL, I make a better quilter then sprinkler fixer. 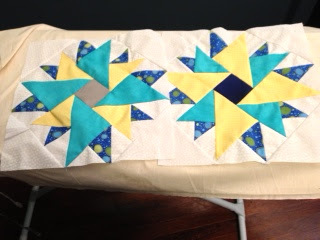 I started quilting another of the 5 Baby Bricks Quilts I have now done 2 of them with the tight stitching. It looks amazing, but it is a long process to do it. I think Tanya loves it more then the echo now and I will be doing more of it. One of these days I need to work again on my FMQ. Now that I am a little more sure of my work it may look better and also gives another way to have the tight look. Must try it I think. 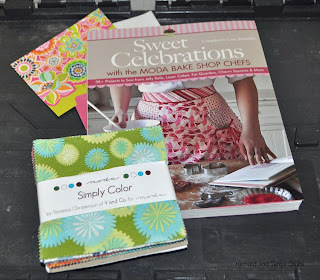 For any that have not already done so, remember to enter the giveaway for Tanya's B-Day on yesterday's post. Today is Tanya's B-Day (as well as Memorial Day) As a family we will be celebrating by having some some friends over and having lunch with them. But then that is not what you want to know about is it? Today's Giveaway includes 2 pink and 2 green fat quarters from Me and My Sisters (One of Tanya's favorite designers). 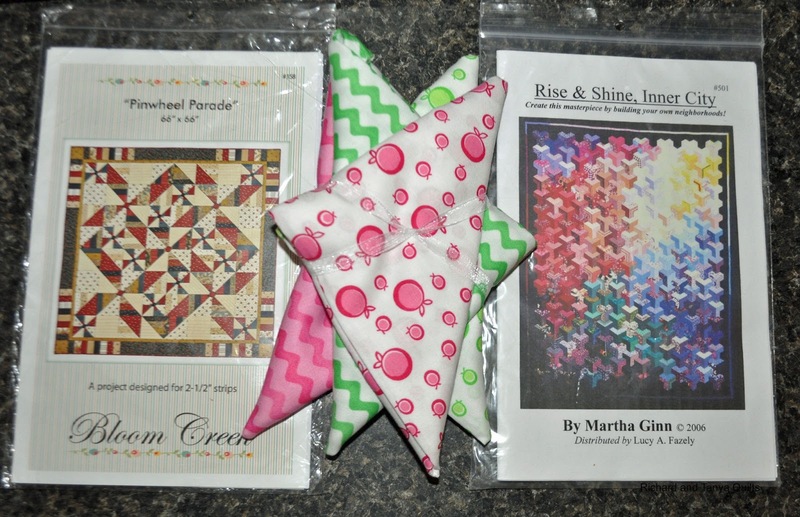 We are also throwing in 2 quilt patterns to get you a starting idea for a quilt. To enter and win is going to be simple. Giveaway Closes Friday May 31 at 10 pm. You can have up to 3 chances to win. One chance for each of the 3 items listed below. 1) Just leave Tanya a Happy B-Day Greeting (I will twist her arm and make her answer every email if you do, as well as a answer from me). 2) Do any one (or all if you desire) of the following list. 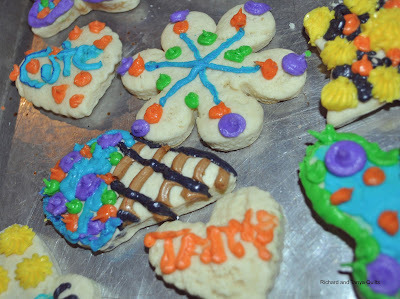 Make sure you leave a comment telling us for the entry. 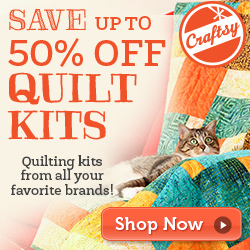 Like us on Facebook, Like us on Etsy (or Favorite a item on Etsy), Follow us on Pinterest, or Follow us on Craftsy. 3) Wishlist one of my patterns on Craftsy (click on the pattern and select add to wishlist) or Save one of my projects on Craftsy (click on the heart on one of the projects to save project) or Comment on either a pattern or one of my projects. (If you would like a free copy of any of my patterns, just let me know in the comment and I will send it to you as a bonus for this entry). Before you run off and enter, let me show you what I got Tanya for her B-Day. 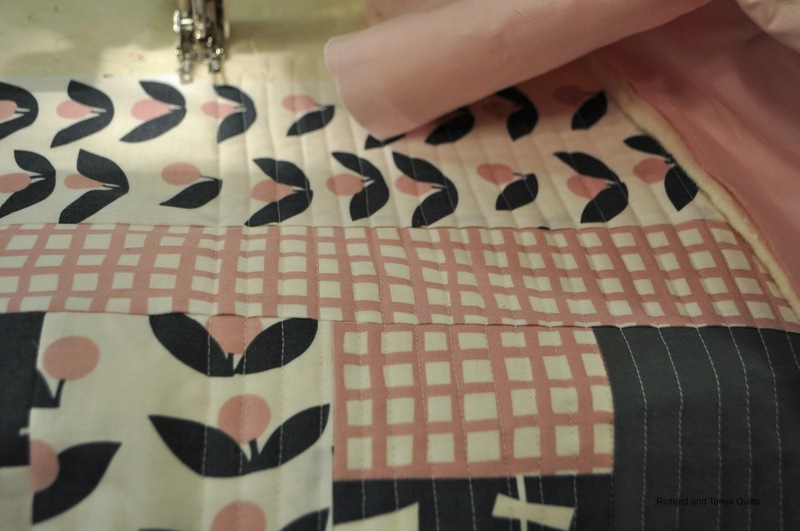 For those of you with great observation skills you will notice that the 2 quilt tops I showed off yesterday are made from the 5 the pink/navy fat quarters in the bottom left. Tonight (well last night, Sunday) I finished 2 more quilt tops with the yellow and grey in the bottom right corner. See she gets the materials and I have to quilt them up. She wants some new baby quilts to add to the Etsy Store. Oh and of course every girl needs flowers for her B-Day. Now go enter and win! The last week or so we received packages in the mail from the Sew Mama Sew Giveaway. I haven't decided if I like sending gifts more or receiving. 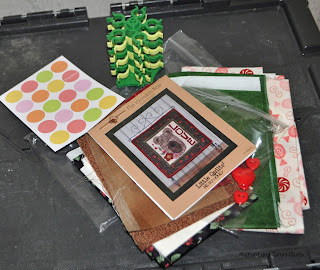 The first picture are items won from Ellie at http://craftsewcreate.blogspot.com/. 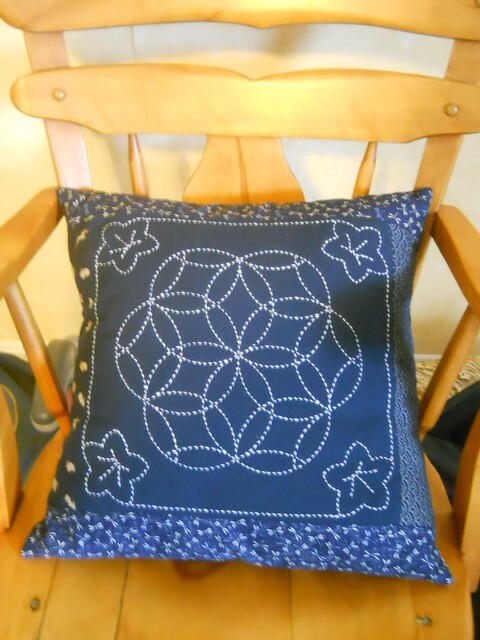 There is a really cute pillow that would work as part of a graduation gift for James next week. I can't really be old enough to have a kid graduating from high school, can I. The second picture is a mini quilt/table topper pattern and fabric and buttons to make it and a bobbin holder tower from Teresa at http://aquiltandaprayer.blogspot.com/2013/05/giveaway-day.html. It looks like a fun project to make. 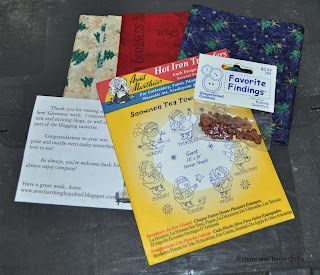 The third picture is Christmas fabric, buttons and snowman transfer from Anita at http://sewcharminglyquilted.blogspot.com/2013/05/sms-giveaway-winners.htmls . Fitting prize for someone who lives on street named after a Christmas Flower, IE Poinsettia. Now to start thinking of project to use the fun Christmas fabric. It is Memorial weekend and a time to reflect on those we have lost. In our family, less than a year ago my Father Lynn Jay Healey passed away. I know that this can be a sad time of remembrance, but for me it is not. My dad had a great love of Boy Scouts and to celebrate, I took my 11 year old scout patrol out and cooked breakfast at the park in the dutch oven. I learned from my father how to love life and have fun and to work hard and be honest. He is loved and not forgotten. Also a high note, when I got up this morning and checked my Craftsy Patterns it turns out that my Pattern took a short trip on the trending board at Craftsy, the 2 times I checked I was at 17 and then 16 in the top 20. 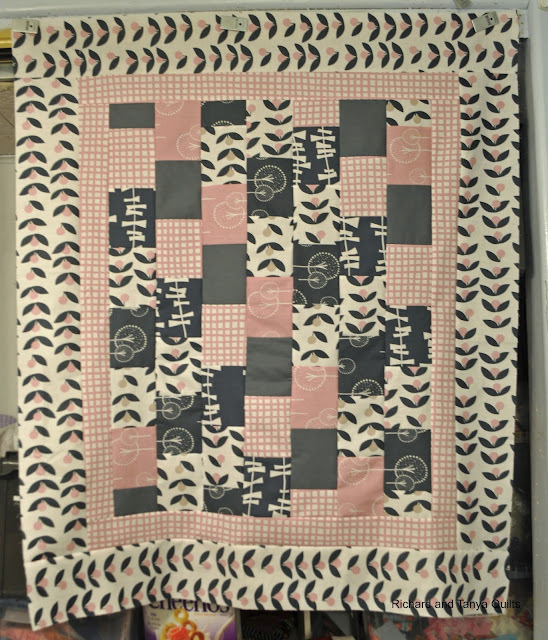 I took a picture of it (below) sadly my quilt is no longer on the top 20 board, but I enjoyed it while it was (gives you a warm feeling to have your name up in lights). 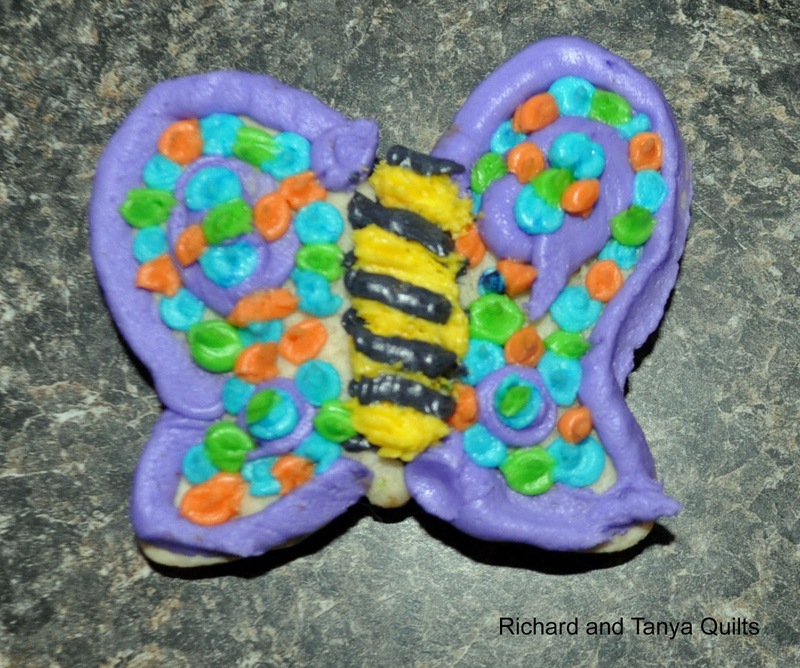 If you use Craftsy please stop by my patterns and if you so desire follow me on Craftsy. I have don't know what gets you on this list, but that would have to help some I would think. Oh wow, Its back on the list again and now at #4 Oh wait its number 3 (Not going to take another screen shot) So help me out and go visit, follow me and comment on my projects and patterns and if you desire buy a pattern. Recently I started putting our patterns in our Pattern Store on Craftsy. 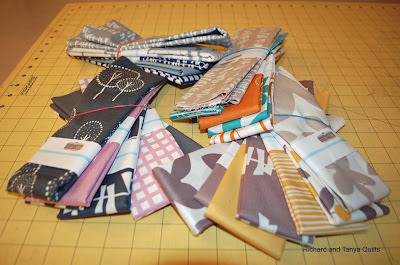 I have 7 patterns so far listed and I am creating another pattern that will be listed in the next week or so. As part of making the pattern I wanted to get some better pictures for it so Tanya bought me some fabric and I made these 2 tops using my pattern. For a lack of a better name Tanya called it baby blocks. We have in the past already made 3 other quilts with roughly the same pattern. 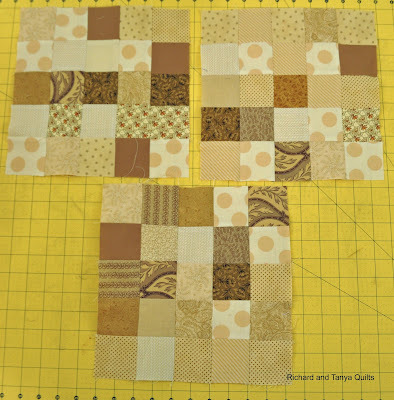 Along with these 2 tops I have cut out the centers of 3 more quilts. I will show them off in a week or 2. Tanya has made some lofty goals for getting more baby quilts on our Etsy store and so both of these 2 will end up there when done. 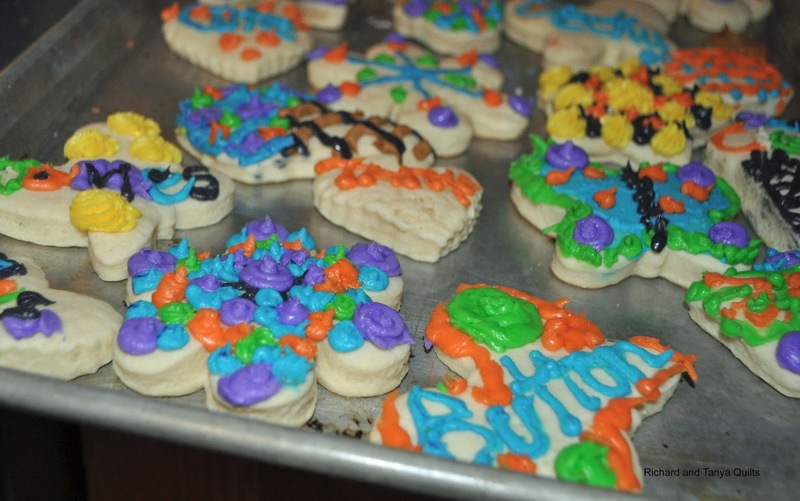 While I was making quilt tops, Rebecca was making some "Test Cookies" for a talent show off next Friday in her seminary class at school. One thing that is nice about test cookies is you must test them by eating them. Rebecca started to protest after Jared had eaten his 7th test cookie. You have to admit, he is a great tester. This butterfly was the one I tested and it tasted great. 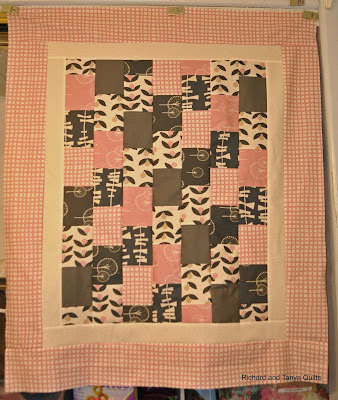 A quilt top made by me that will be shortly a pattern on Craftsy is my last quilt top for this week. Check back on Saturday to see a post about this. Today's Post is not so exciting. I have been working again on Tanya's Quilt. This is one planned for our bed. 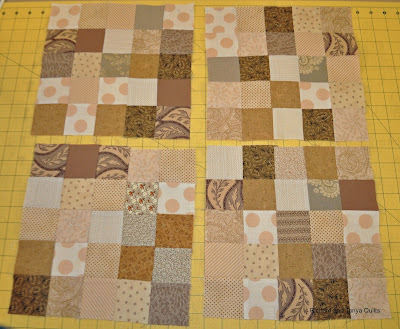 The quilt will be a scrappy quilt made out of 2 1/2 inch blocks queen size. Thanks to a friend Susan from http://desertskyquilts.wordpress.com/ Tanya got a fresh supply of browns and tans which spurned me to work again on it (and of course caused another shopping trip). 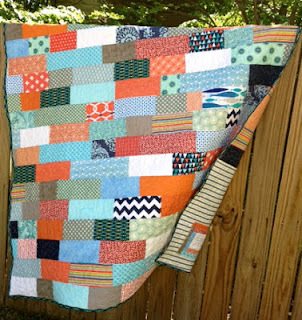 The quilt its self will be a checker board of turquoise and brown. The "Richard's Star" block that I created the star from it will be in the middle of the quilt with the points being made from the tan blocks above. Each point is 1/2 of the block above. Of course there will only be 8 points (4 blocks) so I over did it making 7. I like to be safe rather then sorry, so I had extra blocks so Tanya could pick her favorite. The other day my camera ran out of power so I used my son's camera to take a few pictures and I realized that I found a lost photo. 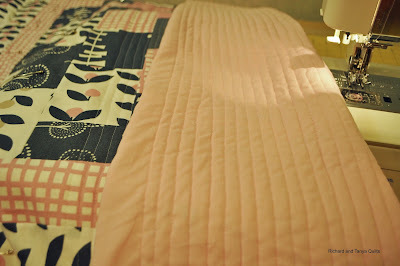 The above top was made almost a year ago (and completed quilt was delivered last Christmas to my sister in law Marsha). But we never put the quilt on the blog as a finish and before I forget it again wanted to make sure that I put its picture up. This is of course the Ghastly line and we fussy cut out all the pictures and framed them. in wonky blocks.